It's never been easier to capture high-quality images through your telescope! The Celestron Smartphone Adapter is custom-fit to Celestron"ªs Ultima Duo eyepieces and your smartphone. That means you'll get an ultra-secure connection without play for sharp images and steady videos. Unlike "Ïuniversal" adapters, Celestron"ªs Smartphone Adapter has no moving parts and requires no manual adjustment. 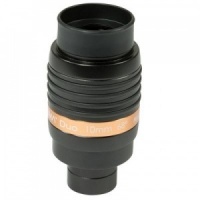 Simply slide the adapter over the eyepiece. Since the Celestron Smartphone Adapter is designed to fit the exact diameter of the Ultima Duo eyepiece, your camera is perfectly centered every time. 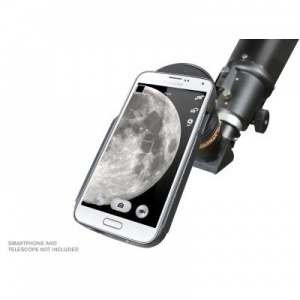 The Celestron Smartphone Adapter works with any telescope compatible with Ultima Duo eyepieces. It"ªs perfect for capturing the craters on the Moon, sunspots and solar prominences (for solar telescopes or telescopes with a solar filter), the planets, and even the brightest deep sky objects such as the Orion Nebula. You can also use the adapter for daytime imaging through your telescope. Once you've captured the perfect shot, share it with friends"Óyou can use all the functions of your phone without removing it from the case. You can even use your camera for traditional photography while it"ªs still in the adapter; just remove the ring and you"ªre ready to take wide views with your phone.